Hope everyone had a wonderful day yesterday February 14th better known as Valentines Day! Whether you celebrate the “holiday” or not, I’m always sending smiles and hugs your way. Just to update you-stylish-sweets-you; I’m still having laptop, battery, power cord issues but don’t fret. There’s currently a battery on its’ way to me as you read this! According to my shipment tracking numbers, it should be here by Saturday! With that said, I’m sending the rest of my love to the mail and delivery people! What’s a blogging girl to do without her laptop? Easy…shop! I had a little retail therapy in the form of beauty products (nail polish goodies to be exact.) I made a trip to Target to get oohh I don’t know, maybe three or four things but ended up at the register with a buggy full of stuff. Target gets me EVERY single time you guys! Price: roughly $6 for each set/kit. I purchased two kits, Gala: White, Black and Silver Glitter along with the Masquerade: Hot Pink, Blue and Green. Each kit comes with three nail polishes and 30 different sticker stencils. 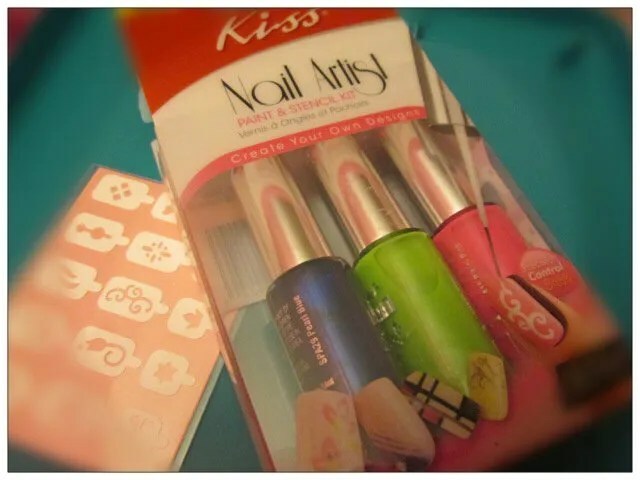 The nail polish has a long and thin brush attached to create the small designs with the stickers. For this weeks mani, I chose to use the Masquerade kit because it has the pink polish, jackpot! Now, this seems easy enough to use, right? Right. Well, it’s easy but it’s also tedious and time consuming. First, you have to paint your nails and let them dry completely otherwise, once you put the sticky stencil on your nail, the paint won’t last. Then all that hard work of staying inside the lines for two or three coats would be all for naught. Here’s what I did, painted my nails the night before then applied the nail art 24 hours later. That pretty much assured me, the base coat was dry. Now, the fun part! Picking a stencil from these 30 stickers. Since it’s the week for lovers ie Valentines Day, I went with hearts…can’t go wrong with hearts! Kiss’ directions tell you to wipe the excess polish off the brush and gently sweep the brush across the nail. Yea, umm no. You’ll quickly realize you’re going to need that excess polish in order for the shape of the heart to actually transfer onto your nail. I’m not saying just drop polish on the nail but it’s sort of a trial and error type deal. Once you do two nails, you’ll know exactly how much polish you need for the desired effect. Once all of that is finished, you’re done! Now, me being the perfectionist that I am, I went back over the hearts with polish to fill them in for a more vibrant look. On a couple nails, I applied more polish than needed to give the bigger hearts a 3D or puff paint effect. Of course, I didn’t use the stencils again because I’m positive it would never fit back in the exact spot. Here’s the final results! I’m a lefty and you can definitely tell which hand looks best lol! It’s so much harder for me to work with my right hand and paint my left hand but it still came out pretty good! Overall, the Paint & Stencil Kit is a fun nail art pack that allows anyone to become a nail tech for a day or two. With that said, I’m almost sold. Glad I’ll have these great nail polishes with thin brushes to use with other nail art projects but the chances of me using two whole days for another nail art project are pretty slim. As always, I’m willing to give it another go…stay tuned to see what else comes out of these kits!